Incredible! I’m listening to a recent episode of the Skeptoid podcast, this one on Hollywood myths. 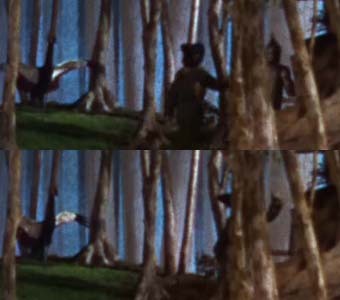 It turns out that some people actually believe that the suicide of a Munchkin was recorded on film in The Wizard of Oz. Brian Dunning, the producer of Skeptoid, says where the alleged hanging body can be viewed, and suggests that it is most likely one of the birds they had on set. I immediately thought ‘Blu-ray’ of course, so I popped in the disc and watched the section he mentioned. And all I could see was what was bleeding obviously a bird. A large colourful one. I don’t know my birds at all, but it seemed to be some kind of crane, largely black or very deep blue, with a yellow crest on its head and yellow and white wings. Don’t believe me? Here’s a grab from the Blu-ray, or rather crops from two of them. Soon after this the camera backs up a little (as the trio of performers approach it), making the bird a bit smaller in frame. As you can see, as the bird becomes more upright to see (as I imagine) what’s approaching, its neck comes to align with a tree behind it (probably not a tree, but a painted tree on a backdrop). All detail largely disappears, aside from a yellow dot for its beak. See how the bird’s beak becomes more prominent on the later (lower) frame as it moves more into profile. With the enhanced clarity of Blu-ray, it’s quite impossible to see any hanging bodies, or anything else other than a large bird. I haven’t changed the screen grabs in any way, other than cropping them down to size. These are what you’ll see on the screen. So how did some people come to be believe anything different? Well there are two parts to this: one that makes sense and one that’s irrational. The part that makes sense is the fact that in most previous versions of the movie, it was nowhere near as obvious that this was a bird. Now, to my eye both of these both look like the bird I’ve discussed, because my brain fills in the indistinct image with what I already understand it to be, but I imagine that if you haven’t seen a clearer version, these might be indecipherable to some. Which brings us to the second part. To believe this claim you have to have the capability of interpreting an indistinct blob as a hanging Munchkin body. That’s the irrational part. Why not — if not the bird itself — a prop swung loose from the ceiling and hanging suspended? Why not some of the fake tree cladding springing free from its glue and waving in the breeze? Why a body? Of course, a true believer will be able to claim that Warner Bros has covered this up by digitally painting a bird into the Blu-ray version to cover up the suicide, but once you stray into that kind of territory, rational argument becomes rather pointless. This entry was posted in Blu-ray, Cinema, Imperfect perception. Bookmark the permalink. 2 Responses to Death on Oz? Thanks Ben. Actually, I was referring to the beak as becoming a little clearer as the bird turns (up the top). Yes, the bird’s wing also becomes clearer too. African crane, huh? Amazing what they had in Oz!